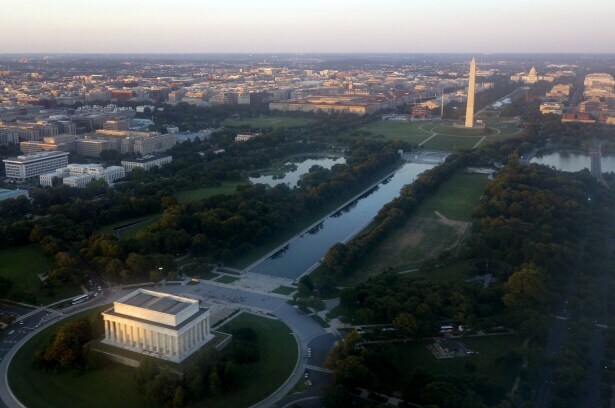 The skyline of Washington, D.C., is seen on June 15, 2014. Baker Hostetler has hired Eulonda Skyles, an in-house leader from Capital One, to join the ranks of its already formidable team of privacy and data protection attorneys. Skyles was most recently Capital One’s associate general counsel for privacy and data security. She’ll work in Baker Hostetler’s Washington office. Skyles told Bloomberg Law she joined the firm because of its culture and ability to foster collaboration in its work across sectors and industries. She said the firm is “first in its class and at the top of the list” when it comes to providing clients with advice around data issues. “I saw them as a very nimble strategic firm the privacy space,” she said. Baker Hostetler said in the announcement of Skyles’ hire that its data privacy and protection team has worked on nearly 25 percent of data breaches reported in the past year. Skyles, who has worked extensively with tech companies and financial institutions said she’ll likely continue working with banks and the vendors that serve them, as well as with fintech companies. She noted that newer laws, such as the General Data Protection Regulation from the European Union, as well as the California Consumer Privacy Act are posing challenges for clients in her area of practice. So are older laws that are still on the books but have to be “reinterpreted, reexamined and applied to new technologies,” she said. Skyles joined Capital One in 2014 and served as associate general counsel for IP litigation before moving to her in-house privacy and data security law role at the company. Earlier in her career, she served as litigation counsel at Yahoo! Baker Hostetler has more than 960 attorneys in 14 offices nationally.